Louis Braille was the inventor of the Braille system of reading for the blind. 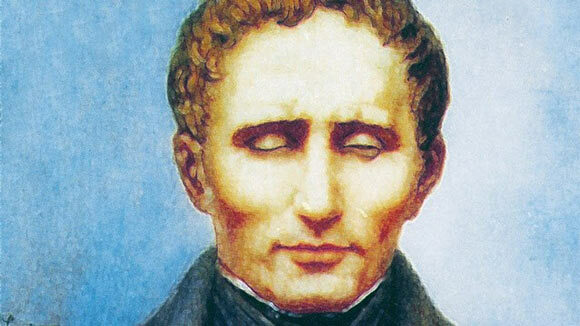 He was born on January 4th, 1809 in a small town named Coupvray in France and was the youngest child of Simon-René and Monique Braille. Simon-René had a business manufacturing leather goods and had his own workshop in the house. As a child, Braille loved spending time in his father’s workshop. When he was three years old, he accidently poked himself in the eye with an a sharp tool called an awl that he found in his father’s workshop. The infection spread and Braille soon lost vision in both his eyes. Braille’s parents were very supportive and provided him with the best education available at the time. He continued to go to school and learn what he could through oral instruction. Because of his excellent academic prowess, he was sent to study at the Royal Institution for Blind Youth in Paris when he was 10 years old, where he also received a scholarship. The students here were mostly taught through oral instruction but there were also some books available in raised print. This was a system developed by the school’s founder Valentin Haüy, who was not blind himself but was a devoted philanthropist. Haüy made these books on heavy paper by embossing Latin letters on them. The reader could trace his or her fingers over the paper to make out the letters. This was the only method available to them at the time but it was a slow and difficult process, with a limited amount of information available. The books were also cumbersome to hold due to their size. Braille made full use of the knowledge and resources available to him, and soon became a top student, particularly excelling in music. After he had finished his studies, he was asked to stay as a teacher’s assistant, and later as a professor. He taught history, geometry, and algebra and pursued his passion for music, becoming an accomplished organist and cellist. In later life, he played the organ in churches all over France. Braille always felt that the reading system he had learnt under was too cumbersome for extensive learning. He got his inspiration to develop a better system after learning about the raised dots method devised by Captain Charles Barbier of the French Army. Babier’s invention was mainly intended for soldiers to communicate with each other in the dark during war time. It was based on an array of 12 dots, which could be rearranged to form different letters and words. The words were based on phonetic sounds, rather than the actual spellings. Braille decided to adapt the system to make it easier and more efficient. He reduced the 12 dots to six smaller ones, and made a column of uniform size to fit each letter. The main advantage was that each letter could be read with a single touch, which made the process much faster. Braille also developed a system of musical notes and published his findings in his book. Although he kept improving and perfecting his system, it was not adopted for popular use until after his death as there was some hostility among the school administration for switching from the already established method put forward by Haüy. However, his method has now become the worldwide standard used by the blind. Braille died in 1852, at the age of 43 due to a respiratory disease. He is now regarded as one of the greatest pioneers in helping blind people to progress. His childhood home has been listed as a historic building, and a statue of him has been erected in the town square. The 200th anniversary of his birth was celebrated throughout the world in 2009 by issuing coins and stamps with his face in various countries, and holding exhibitions about his life.